You will be given a Free reference e-book to read which has 480 pages And the test will be based on that e-book. What is IBM System Support? IBM system support refers to the kind of support that you usually get in case your IBM system starts to malfunction. If you want to obtain the highest level of proficiency in this field, then be aware that you need to first improve your technical support skills for the virtualization technologies linked to IBM. You need to enhance the level of your technical expertise so you can be of help to external and internal customers especially in the process of designing, implementing and managing virtualized environments. It should be noted that a successful passer of the IBM system support certification exam is someone who is capable of establishing a good plan when creating a virtualized environment and install and provide on-going support to different types of clients. To become a more effective certified IBM system support expert, you are also required to hone your skills in performing mobility, implementation and migration tasks. You are also required to improve your familiarity about the specific environments that perfectly suit provided requirements. 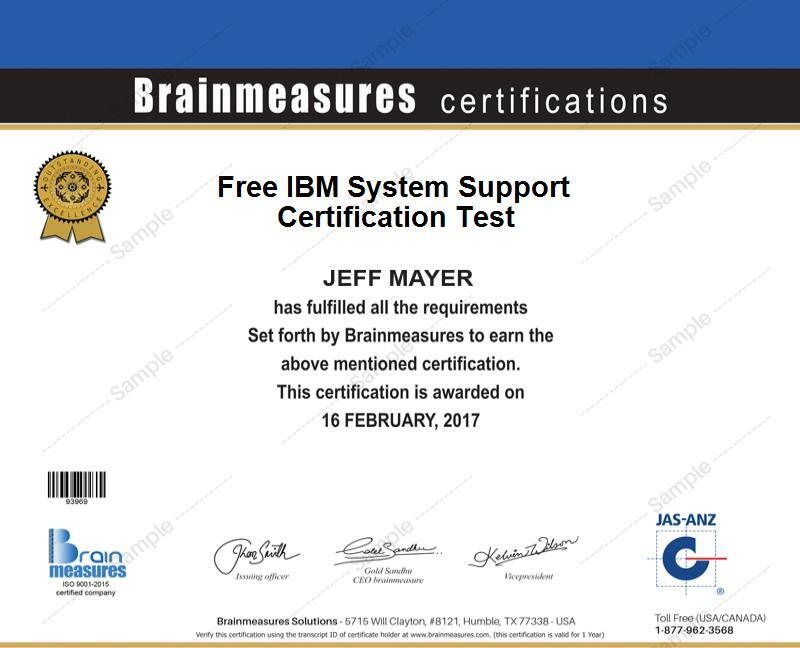 The good thing about trying to improve your expertise in the IBM system support field is that you can now take up the free IBM system support practice course which is now provided by Brainmeasures. It offers a free study guide which is essential in your attempt to fully understand all aspects relevant to the field as well as a free practice test which is essential in making preparations for the actual certification exam. The free IBM system support certification practice course which is now introduced by Brainmeasures to the public is really perfect for you if you really have a strong desire to understand the whole field. Brainmeasures has already become popular because of its ability to develop the most effective and extensive online certification courses so you have an assurance that its free IBM system support practice course is also capable of providing you with the most reliable information. The free study guide which you can get upon enrolling in this free practice course also contains the most accurate and relevant information about the field so increasing the level of your expertise will no longer become a problem. You will also enjoy the presence of its free practice test because it works in letting you experience what it feels like to take the actual certification exam so you can make the best preparations. With the type of learning that you can get from this free practice course offered by Brainmeasures, passing the exam and receiving your IBM system support certificate will no longer become a problem. How to execute the device and adapter configuration process? How to effectively manage and configure physical volume? The free IBM system support practice course offered by Brainmeasures is extensive enough that you can expect it to work for anyone who dreams of passing the IBM system support certification exam. It mainly targets all aspiring and existing IBM system support staff, technical support staff, administrators, consultants, analysts, testers and other individuals and professionals who are mainly responsible in maintaining the good condition of an IBM system after installation. You will also enjoy a huge increase in the level of your salary as soon as you pass the IBM system support certification exam. Your certificate is extremely useful when attempting to work as an IBM system technician and earn around $57,000 to $90,000 yearly. You can also use your certificate to become an IBM system support staff which will enable you to earn up to $148,000 annually.